﻿ As strange as it sounds given their almost permanent ubiquity, it feels as though people have started caring about blink-182 again. The inclusion of Matt Skiba to replace Tom DeLonge has left the trio galvanised once again, and in better, more fertile creative stead than they have been in a long time, given the praise awarded to California last year, and its mammoth reissue earlier this year. Even this, their first full UK tour in five years has come around with far greater anticipation at seeing both what this new lineup and new material have to offer. And when considering that last tour was postponed by a whole year, that’s saying something. Arriving to considerably less anticipation are The Front Bottoms (7), and to say their geeky indie-emo doesn’t connect with the already full arena would be an understatement. Still, there’s an eagerness to please here, whether it’s Brian Sella’s playful patter with the crowd, the rousing stomp of cuts like Au Revoir (Adios) and Twin Size Mattress, or the peddling of their current line of Great British Bake Off-themed merch. Even though they probably won’t be taking on arenas on their own any time soon, The Front Bottoms have definitely made some new friends here. For Frank Turner & The Sleeping Souls (8) on the other hand, venues like this have been their stomping ground for some time now, and even faced with a surprisingly large contingent of the crowd unfamiliar with them, there’s such a universal appeal to their rousing folk-punk. Most of that is down to Turner himself, with the sort of affable energy you wouldn’t expect from a man 2,000-plus shows deep. And yet, Out Of Breath and Try This At Home feel tailor-made for this sort of crowd, and there’s an inclusivity to I Still Believe and Four Simple Words that puts the full stop on why Frank and his band have the command they do on the UK scene at large. 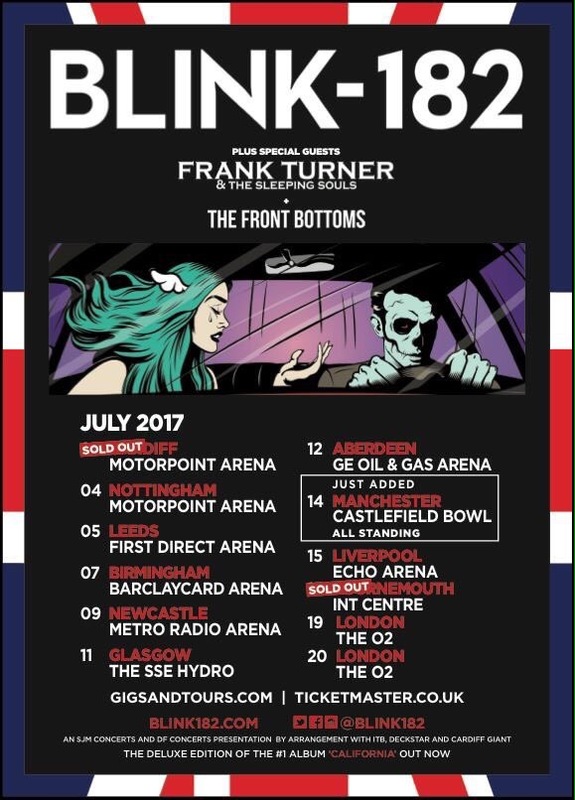 But there’s still the main event to go yet, the momentous return of blink-182 (7) to UK shores since their 2014 Reading and Leeds headline slot, when the cracks between DeLonge and the rest of the band were at their most publicly evident. But when the Stranger Things intro ends, the curtain drops and the band launch into Feeling This, there’s an immediate feeling that this is a far more comfortable incarnation. It’s definitely reflected in the setlist, avoiding everything from the lukewarm Neighborhoods in favour of the big hits, deep cuts that still have fan presence like Reckless Abandon and Dysentery Gary and the right cuts from California to really fit the more upbeat vibe. She’s Out Of Her Mind should be a set staple for the foreseeable future, and there’s a driving force to Los Angeles that has been missing from this band’s arsenal for far too long. Though with an engine room as sturdy and well-worn as theirs, it’s no wonder they’re in such a good place at the minute. Mark Hoppus is one of the most likable figures in pop-punk by a country mile, with a vivacity that goes hand in hand with his bass playing. Then there’s the human dynamo that is Travis Barker, still amongst the top tier of drummers and adding a loose-limbed complexity to each song. Not only that, but it’s clearly a skill that runs in the family, seeing how his 13-year-old son Landon hops behind the kit for a surprisingly competent solo to close out the night. But what needs to be addressed is the elephant in the room, that being Matt Skiba and how well he fits the dynamic live as opposed to on record. And honestly, it’s a bit of a mixed bag. He’s a marked improved vocally over DeLonge (duh), taking Down and especially I Miss You and turning them back into the heartfelt numbers they were intended as – no more “yead”s; no more “toyme”s; just the songs sounding as they were intended, and it’s so refreshing to hear. But then again, Skiba himself seems to be more of an accompanying presence here than a fully-integrated member, perched onstage virtually motionless and sounding surprisingly quiet at numerous points. Granted, his tenure in arenas has only been fairly recent taking on this relatively unfamiliar material, but even so, there appears to be a distance that hinders how smoothly the whole thing runs. As such, this still feels like blink-182 With Matt Skiba rather than The Mark, Matt & Travis Show, with Skiba filling an empty role rather than being a fully-fledged member. As a set, it’s far from a washout – blink are far too proficient as a band with too much of a stacked back catalogue to outright fail at this point – but it is indicative of the point that they’re at, not as jaded and perfunctory as in 2014, but also not as seemingly reinvigorated as in 2012. Perhaps the paradigm of blink isn’t quite as solid yet as it would appear on record, though compared to how the last phase of the band ended, they’re hurtling in the right direction.